For Peter Sloterdijk, Friedrich Nietzsche represents nothing short of a “catastrophe in the history of language”—a new evangelist for a linguistics of narcissistic jubilation. Nietzsche offered a philosophical declaration of independence from humility, a meeting-point of sobriety and megalomania that for Sloterdijk has come to define the very project of philosophy. Yet for all the significance of this language-event named Nietzsche, Nietzsche’s contributions have too often been elided and the contradictions at the root of his philosophy too often edited out. As Sloterdijk observes, “Never has an author so insisted on distinction and yet attracted such vulgarity.” Nietzsche Apostle, drawn from a speech Sloterdijk gave in 2000 on the hundredth anniversary of Nietzsche’s death, looks at the ways in which Nietzsche has been branded over the years through selective compilation, and at the ways in which Nietzsche turned himself into a brand—a brand announced by his proclaimed “fifth Gospel,” Thus Spoke Zarathustra. For Sloterdijk, the focus should not be on the figure of Zarathustra or on the “will to power” often used as a kind of philosophical shorthand to sum up Nietzsche’s work, but on Zarathustra’s act of “speaking” itself. 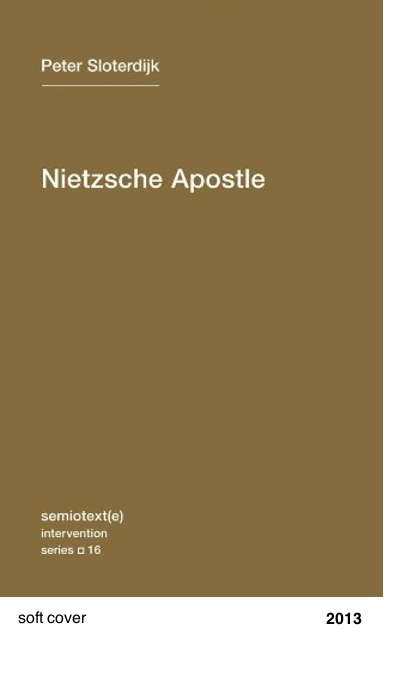 Nietzsche Apostle offers a brief history of self-praise and self-affirmation, an examination of the evolution of boasting (both by God and by man), and a very original approach to Nietzsche, philosophy’s first designer brand of individualism.